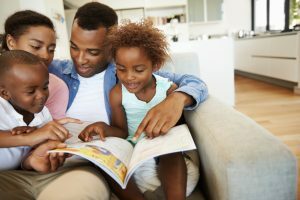 Deployment is difficult for everyone in the family, but it can be especially hard on young children who may have trouble understanding why dad or mom can’t be at home. Here are five books that can help children get through those challenging times. You and Your Military Hero by Sara Jensen-Fritz, MS, Psy.S., LP, Paula Jones-Johnson, BSW, M. Ed. And Thea L. Zitzow, BS, M.Ed. This book for elementary-age children won the Military Writers Society of America 2009 Gold Medal. It features fun, adult-guided activities and games that help children learn coping skills during a loved one’s deployment. A dog named Flipp takes the child through the book while encouraging positive thinking. This book is not specifically focused on a parent’s deployment and refers to the service member as the STAR (Someone to Always Remember) Hero which could be a parent, grandparent, or other relative or friend. Available in both “Daddy” and “Mommy” versions, I’m a Hero Too! explores the emotions a young child may have when a military parent is absent. Written by a retired service member, the story is not specific to any branch of the military and helps children understand their feelings and offers insights into how the child can keep in touch with the absent parent. This story for children ages 4 – 8 is about a little girl named Lily, who is unhappy when her Daddy is deployed and she has to say goodbye. The book explores her feelings of wanting to be connected to her father and how she copes until her Daddy returns home. The author originally wrote the book for her then 4-year old granddaughter who was sad when her father was away in the Navy. Lily Hates Goodbyes comes in an All Military version and a Navy version. Author Beth Andrews is a social worker who has worked with military families, helping them deal with the stress of deployment. I Miss You! was written to assist children and their parents adjust and cope with deployment-related emotions. Children are encouraged to talk and draw to express feelings like sadness, fear, anger, and anxiety. Through rhyming text and Mark Braught’s engaging illustrations, this book for very young children introduces the concepts of serving the country and deployment. It shows ways children can feel close to the absent parent and helps them understand why the parent is away and the importance of patriotism.